Troy “The Carp Catcher” Rimes, 51, of Germantown, with the 30-pound carp he caught in the Schuylkill River in Center City Sunday. As Troy Rimes played tug-of-war with whatever beast was on the other end of his fishing pole, a crowd gathered to watch on the bank of the Schuylkill near Locust Street. "People were staring at me like 'What do you have on there?' And I was like 'Whatever it is, it's big,' " said Rimes, 51, describing his struggle with the creature submerged beneath the murky waters of the river on Sunday afternoon. But Rimes didn't flounder. After about 10 or 15 minutes, he and a friend were able to pull the 30-pound carp from the water. One woman screamed, he said. "She couldn't believe a fish that big came out of that river," Rimes said. 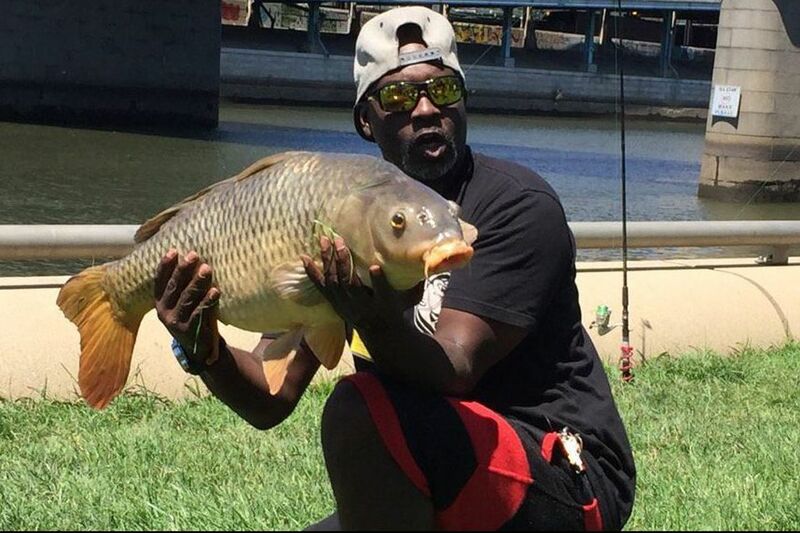 Once Rimes and his friend got the fish out of the water with a net, a stranger ran up to assist with hoisting the carp, said Amara Rockar, a 32-year-old from West Philadelphia who witnessed the catch. "There was applause from the grass when the fish finally came into view. A dozen or so people came up to take photos and one young guy, of course, knelt down to try to selfie with the fish behind him," said Rockar, who posted a photo of the catch to Twitter. Rimes said he was overwhelmed by the response. "You would have thought I was some kind of superstar the way they were taking pictures of me yesterday," he said. After everyone got their photographic proof of the carp, Rimes — as is his custom — threw back his valiant foe. Today was not this fish's day to die. Carpe Diem! While the crowd was shocked by his catch, Rimes —who has been fishing in the Schuylkill and Delaware rivers since 1974 — said he's caught bigger and weirder (but not weirder than a catfish falling from the sky). He said he once pulled an eel from the Schuylkill and claimed to have caught a 43-pound carp in the river three years ago. "I'm really trying to get the carp record for the Schuylkill," he said. "I'll get it one day." The largest carp ever caught Pennsylvania was reeled in from the Juniata River in Huntingdon County and came in at 52 pounds, according the state Fish and Boat Commission's website. Rimes believes the record for a Schuylkill carp is 47 or 48 pounds. A spokesman for the commission was trying to obtain the official figure. Rimes grew up in public housing in North Philadelphia and said he learned to fish from men in his building, who would teach the young kids to keep them out of trouble. Now, Rimes — who lives in Germantown and cleans the Paoli Regional Rail Station as a subcontractor for Amtrak — fishes with a group of about 25 others who call themselves the East Falls Fishing Crew. He said he uses a homemade cornmeal mix to reel in carps. But when asked for the ingredients, Rimes clammed up. "I'm not going to give the recipe out over the line," he said.